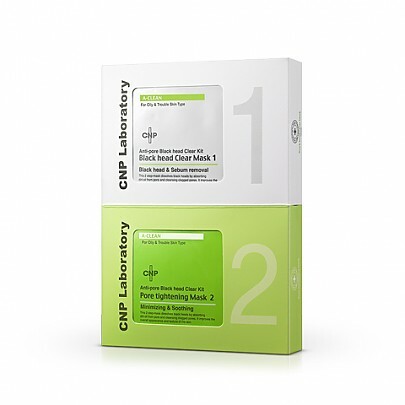 Radiant your Skin Care with the [CNP Laboratory] Anti-pore Black Head Clear Kit (10 set)! we aim to provide you best korean products to take good care of your skin, including Cosmetics, Skincare, Mask Sheet. Hydra Mask Sheet online. This 2-step mask is specially designed to remove blackheads and excess sebum to achieve blackhead-free skin without squeezing. 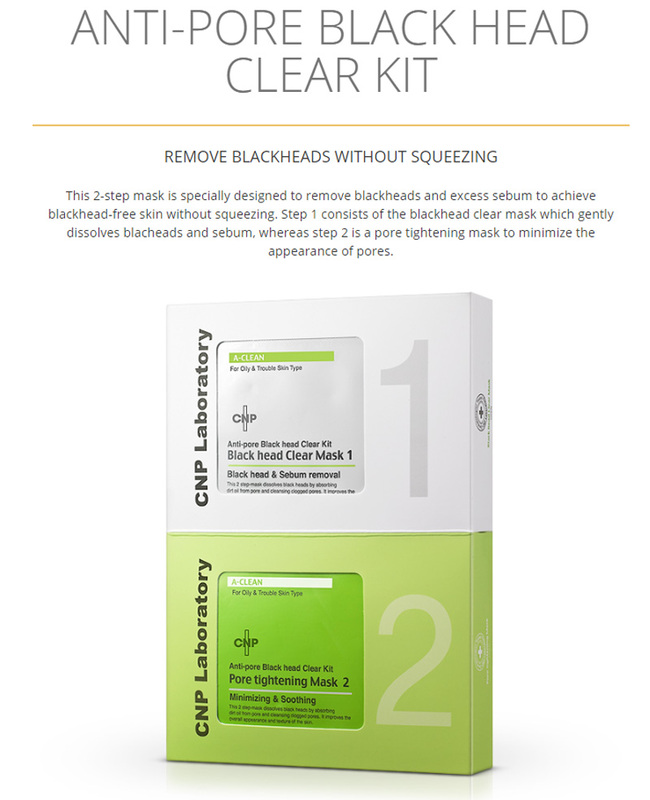 Step 1 consists of the blackhead clear mask which gently dissolves blacheads and sebum, whereas step 2 is a pore tightening mask to minimize the appearance of pores. - Step 1 gently removes the black heads with no physical stimulation.CNP’s patented Anti-Irritant Complex reduces skin irritation, making it suitable for sensitive skin. -Step 2 helps to soothe and moisturize the skin after black head removal. - The natural ingredients soften and gently dissolve black heads and help remove excess sebum. - Step 2 is a powerful pore tightening mask that contains Witch Hazel Extract, known for its strong astringent pore tightening quality. Zinc PCA also helps to control sebum and minimize the appearance of pores. 1. Apply basic skincare products after washing face with warm water. Apply Blackhead Clear Mask 1 to area with blackheads for 10-15 minutes. 2. Remove the mask and wipe your face clean with the enclosed cotton bud, in a downward motion. 3. Apply Pore Tightening Mask 2 to tighten the pores for about 5-10 minutes. 4. Remove the mask and pat the area gently to allow the remaining soothing gel to be absorbed into skin. *For best results, use a warm towel on the area with blackhead before using the mask to open the pores.